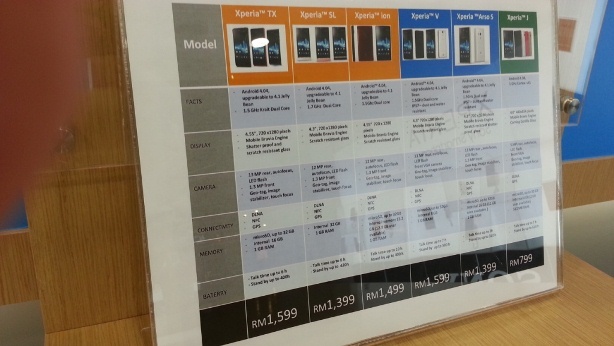 Just about an hour ago, a thread appeared in our forums, with pictures apparently taken in a local Sony Centre which shows the local pricing for the two upcoming Xperia smartphones that is set to make its way here soon: the Xperia TX and Xperia V.
According to the photos, both the Xperia TX and V will be priced similarly, at RM1599. This is rather surprising, as the Xperia T/TX has been billed as Sony’s flagship device (and was even marketed as James Bond’s smartphone of choice, as it made an appearance in 2012’s “Skyfall”). On the other hand, the Xperia TX lacks the 4G LTE connectivity and IP57 certification that the Xperia V sports. The Xperia V, however, has a slightly smaller HD screen of 4.3 inches compared to the 4.55-inch Xperia TX. As this has not been confirmed by Sony Mobile Malaysia, and given that the Xperia TX also is not listed on Sony Malaysia’s official website, we urge some caution on the matter. 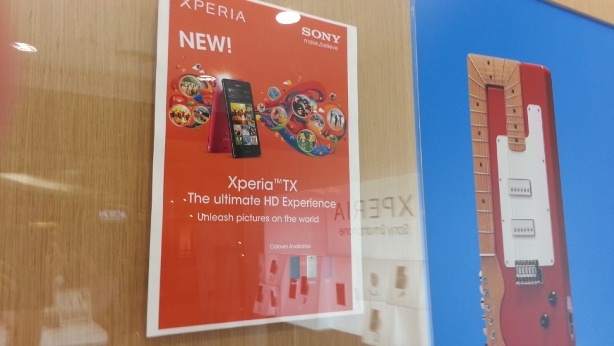 We will attempt to confirm the prices tomorrow with Sony’s reps, but in the meantime, those who are interested in the Xperia TX and V may drop by the Sony Centre in KLCC – where the photos were shot – to see for themselves. On a related matter, it must also be mentioned here that the Xperia V’s LTE connectivity can be used on Malaysia’s 4G LTE spectrum, which would put it among only a handful of smartphones in Malaysia that supports our LTE spectrum.